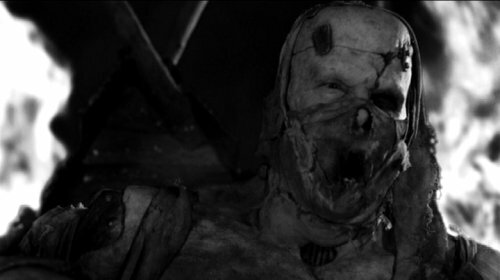 Shuler Hensley as the howling Monster in the splendid black and white opening sequence to the otherwise overbaked fuse-blower Van Helsing (2004). Hensley holds a unique position among Frankenstein actors, having essayed the Monster in three different productions. After Van Helsing, he went on to sing the Monster’s part on a cast recording of Frankenstein: The Musical, a dramatic musical adaptation slated to open off-Broadway in November. Who will inherit the part in that one is yet to be announced, Hensley having since gone on to play the tap-dancing, zipper-necked Monster in the big-budget Broadway adaptation of Mel Brook’s Young Frankenstein, currently in rehearsals. you are being generous, sir! I actually enjoyed this badly acted, chaotic, overtly hysterical film, because it had a: fabulous setting of Transylvania and b: classic monsters.